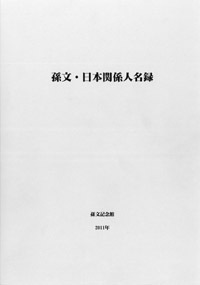 This is a brief introduction to A Directory of People Who were connected with Sun Yat-sen in Japan, which was published by Sun Yat-sen Memorial Foundation in november, 2011. To purchase the directory, or to get more information, you can contact Sun Yat-sen Memorial　Hall. ３，Revisions and Enlargements/Appendix(In Japanese, April 18th, 2017) ※We recommend you to read it. ４，Revisions and Enlargements/Appendix of Revised edition(issued in Nov,2012. the latest rivision(in Japanese) at April 18th, 2017.) ※We recommend you to read it.